Hey guys so today we are going to learn about CPUs, memory organization on RAM, what are buffer overflow exploits, how do they work, how to use them for exploitation,etc. If you have been reading about hacking and exploitation you must have came across the term buffer overflow and exploits. Before continuing you must read these following articles for a better base. Some experience in programming language like C and assembly knowledge will be very fruitful. You would have wondered how exploits and payloads help the attacker to execute arbitrary commands on a target or in simple language hack it. Your main focus while hacking something will most probably be executing desired commands on the target. Buffer overflows help in accessing the areas of memory which you aren't supposed to be. Firstly to understand buffer overflows we must learn about how a code is executed on a system, how it's stored in memory, how a software uses common buffer and memory to process it's work, etc. As previously discussed when you write your code in high level programming language it first gets converted into machine language which can be understood by the processor. In general and for the ease and simplicity we code program first in high level language. It has many constants, variables and instructions to be processed by the CPU for proper functioning of program. These instructions are grouped in so called modules and functions. Fortunately we don't need to code all these instructions in detail in high level programming languages as they are already included as functions in Libraries. A compiler/interpreter takes all these required instructions and convert them into machine code to be understandable by the machine. What happens when you execute a code? CPUs work on instruction sets. CPUs using CISC (Complex Instruction Set Computing) like in most of our PCs are able to perform multiple operations at a time while ones with RISC (Reduced Instruction Set Computing) as in ARM processors in most mobile devices use smaller number of instructions for good performance at lower CPU cycles hence less power usage. The instruction set consists of addressing modes, instructions, opcodes, native data types, registers, memory architecture, interrupt, exception handling, and external I/O. The registers can hold, process and manipulate data. For example a register called Instruction Pointer or Program Counter is used to keep track of what instruction to be executed next by the CPU. The above table is a list of such registers on 16 bit, x86 (32 bit) and x86-64 (64 bit) CPU. The 8 bit registers were called as AL, BL, CL, etc. Prefix "E" in 32 bit registers stand for extended and "R" is used in 64 bit registers. We will talk more about registers further. Now let's come up to memory. Memory is the place where your program is loaded and it's all the local variables, parameters, functions are stored here. The processor then reads instructions from memory and executes them. You need to give everything an address in memory so that you can point to a specific part where a particular data is stored. These addresses are given in hexadecimals. Hex is number system with base 16, like generally we use decimals which has base 10 and binary has base 2. So 0x00000... points the lowest address in memory and 0xffffff... points to the highest address in memory. These are stored in special registers. The topmost part of memory i.e. 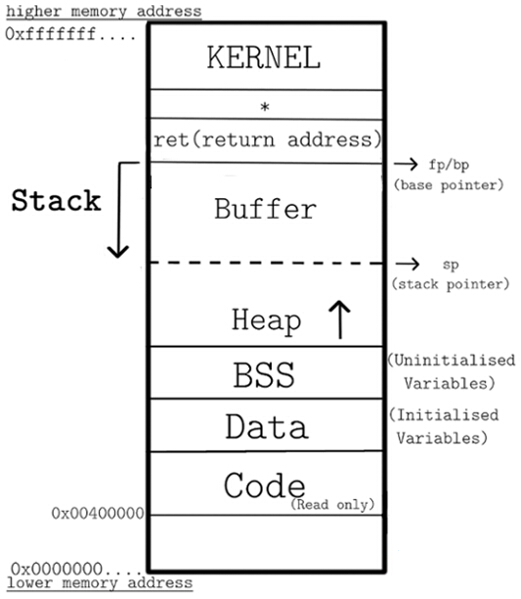 the highest memory addresses are reserved by kernel. It also contains our command line variables (argc,argv) and environment variables. The first here from bottom of memory is code segment. It has all the strange byte pattern for CPU. This part is read only. Any attempt to write in it will lead to memory violation. The next part up is DATA and BSS segment. They contain global variables. If you are familiar with programming you might know that they can be accessed by any function from any code. The DATA section has Initialised variables and BSS section contains Uninitialised variables. Then comes HEAP. Heap is used for dynamic memory allocation. You can allocate memory to heap during execution of binaries by means of family of functions namely malloc. Heap is one of the target site for buffer overflow. Heap grows towards higher memory addresses. Let's discuss STACK now. Stack contains local variables, parameters, and some more information for the functions. In most systems stack begins at higher memory address and moves toward lower memory address. You will find most buffer overflows in this region. The base of stack is tracked by Base Pointer register in CPU. The top of stack is tracked by Stack Pointer. Stacks work on Last In First Out (LIFO) principle. It means the last object to be pushed on stack will be the first to be popped off. After passing the arguments and variables the old base pointer is pushed on the stack. The value of bp is updated to stack pointer, it is stored in base register (bx), some stack space is allocated(sub) and the function is called. This is called function prologue. It's reverse is after the execution, called epilogue the stack space is deallocated(add), the stack pointer is reset and base pointer is restored, and base register is popped off the stack. Another pop operation copies the return address to instruction pointer. The Return address points to the memory address where the program should return the control to after code execution. Data typed in a prompt or gui. Data sent to program over a network. Data provided in a file. The CPU reads the input until it reaches a NULL character, which tells it about termination of string. The buffer is provided a specific amount of space in the memory. As reading an array involves reading towards higher memory addresses, the buffer is allocated memory from lower towards higher memory addresses in most systems. So a buffer and stack can be imagined as set of dishes placed over a spring. Where top is top of stack and bottom as bottom of stack i.e. towards higher memory address. When you put more on top, it pushes downwards. And last object pushed will be first to be poped off. A buffer is like a water tank. You are given a fixed amount of space to fill. But what if you give the input more than it can hold? It overflows and water is spilled into places you aren't supposed to access. The same happens in buffer overflow. If a user input allowed is say 500 characters. What happens if you input 550 characters and the programmer had been too lazy to perform any bound checks and just copies the data onto buffer? The input crosses the buffer boundary and overwrites the memory surrounding it. This should usually cause Segmentation Fault. A segmentation fault/SIGSEGV is raised when you try to access areas of memory which you aren't supposed to access. How buffer overflows can be used for Exploitation?